ABIDJAN, Apr 15 2014 (IPS) - When Ivorian Thierry N’Doufou saw local school kids suffering under the weight of their backpacks full of textbooks, it sparked an idea of how to close the digital gap where it is the largest — in local schoolrooms. 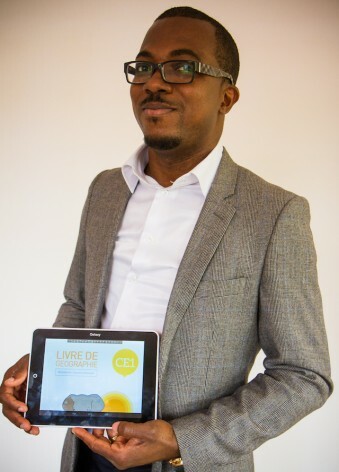 N’Doufou is one of 10 Ivorian IT specialists who developed the Qelasy — an 8-inch, Ivorian-engineered tablet that is set to be released next month by his technology company Siregex. The parent- and teacher-controlled tablet replaces all textbooks, correspondence books, calculators and the individual chalkboards often used in Ivorian classrooms. “It is more than me feeling sorry for them. It is also about filling the digital gap between the south and the north, and bringing Ivorian education into the 21st century,” N’Doufou tells IPS. Qelasy means “classroom” in several African languages, including Akan, Malinke, Lingala and Bamileke. 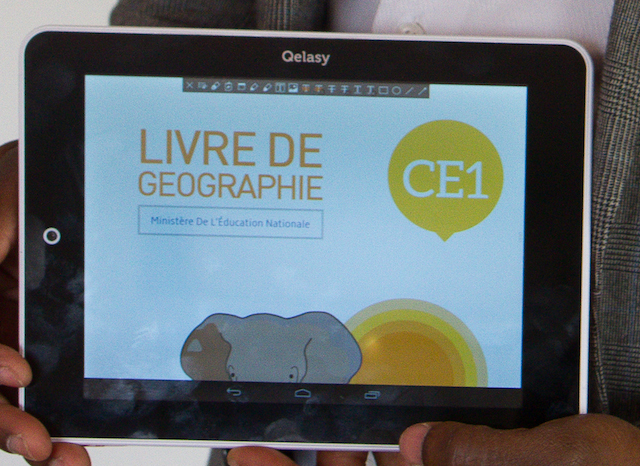 The Qelasy team began by converting all government-approved Ivorian textbooks into digital format. “We were obligated to process everything in a way to have quality images for high definition screens. It is a lot of work,” explains N’Doufou, who is CEO of Siregex. The tablet uses an Android operating system and is resistant to water splashes, dust, humidity and heat. “The Qelasy is protected against everything that an African pupil without transportation might encounter during their walk home from school,” says N’Doufou. “We knew we needed our own product … Our clients’ needs are very specific,” he explained. It can also be programmed to allow kids to surf the web or play games according to a pre-defined timetable. Siregex staff have also developed a store where parents and educators can buy over 1,000 elements like apps, educational materials and books. While the Qelasy is currently focused on education, its marketing director Fabrice Dan tells IPS that users will soon be able to use it for other things. “We believe in technology as a way to create positive changes. And we believe in education. But eventually, we will present solutions in other fields, like agriculture and microcredit,” he says. Qelasy was launched at Barcelona’s Mobile World Congress 2014. Exactly how much it will sell for has not yet been determined, but it is expected to be priced between 275 and 315 dollars. That’s a steep price in a country where, according to government figures, only two million of its 23 million people are classified as middle class, earning between two and 20 dollars a day. While N’Doufou expects the government to purchase a few tablets for use in schools, this product will mostly benefit the country’s middle and upper classes. For now, it is only available for the Ivorian market, but the firm is targeting Francophone and Anglophone Africa. However, the biggest challenge to the success of the product remains the electricity deficit. In a country where, according to the World Bank, only 59 percent of the population has access to electricity, a tablet with an eight-hour battery life faces limited penetration. While N’Doufou says “most of the know-how comes from here,” the Qelasy was assembled in the Chinese manufacturing hub of Shenzen, where 10,000 units have been produced. The Qelasy is merely the latest in locally-developed technologies designed specifically to answer Ivorian problems. Last week, young Ivorian programmer Regis Bamba launched an app to record the licence plate numbers and other details of taxis. Taxi Tracker allows a user to send this information about the taxi they are travelling in to selected users who can follow their journey in real time. It is an attempt to find a way to prevent incidents like the murder of young Ivorian model Awa Fadiga, who was attacked during a taxi ride home in March. The story of Fadiga’s tragic death gripped the nation as it exposed gaps in the country’s security and healthcare systems. She had been left untreated in a comatose state for more than 12 hours at a local hospital, which allegedly refused to treat her until payment for her care was received. “It is my reaction to her death. I saw her picture, and I thought that could be my little sister. I told myself that I could not just sit back with my arms crossed,” Bamba tells IPS. Another application, Mô Ni Bah, was developed by Jean Delmas Ehui in 2013 and allows Ivorians to declare births through SMS. Trained locals then transfer the information provided in the SMSes to a registration authority. It has been another important invention in a country where the great distance between rural areas and government centres has hindered birth registration. According to the United Nations Children’s Fund, almost a third of births are undeclared here. Bacely Yoro Bi, a technology evangelist, internet strategist and organiser of ConnecTIC — a gathering of Abidjan’s IT enthusiasts — says there is definitively a boom in the local IT business. “There is a lot happening here in terms of technology, although it is still limited to Abidjan. There are several start-ups that have been created with a local focus,” he tells IPS. Part of the success, says Yoro Bi, is because of the cooperation among developers. “Qelasy has been possible because there is a techie community that support each other,” N’Doufou points out. Yoro Bi says that Côte d’Ivoire’s inventions should be exported to the rest of West Africa and to the world. With the creation of two free trade zones dedicated to technology in Abidjan’s suburbs, and investments in internet infrastructure, he predicts that inventors like N’Doufou and Bamba now have the potential to go beyond the national borders. Very interesting. How do rural pupils charge it? We’ve been using solar technology to tackle the lack of electricity.